Richard Jones got off to a slow start for single-A Peoria in 2011. Helping him get out of that slump, according to The Peoria Journal Star, was his hitting coach Ricardo Medina. After working with Medina early that May, The Journal Star wrote, Jones' batting average jumped 40 points. "It's just planning - what his plan is and what he needs to do when he goes to the plate," Medina told The Journal Star of Jones. "It's a matter of looking for the right pitch to hit and to be disciplined." Medina spoke from experience. Two decades earlier, he was a minor league hitter himself, playing six seasons in the Cubs system. Medina didn't ultimately make the majors, but he has been helping others try and get there since. Medina's career in baseball began in 1989, signed by the Cubs as an undrafted free agent out of his native Panama. 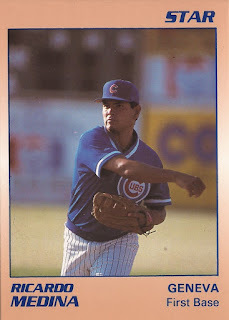 With the Cubs, Medina started at rookie Wytheville, hitting .264 in 51 games. He then moved to short-season Geneva for 1990, hitting .222 over just 41 games there. Medina returned to Geneva for 1991, getting a look at single-A Peoria. Between the two levels, he hit .292, with four home runs and 40 RBI. Medina continued playing at Peoria for the next two seasons, hitting .263 and .254. For 1994, he moved to high-A Daytona, hitting .226 there. It was his final year as a pro. Soon, Medina was a coach. In 2001, he's credited as being hitting coach for the Cubs' Arizona League team. By 2005, he was hitting coach at Peoria. For 2013, Medina was listed as a hitting coach with the Cubs back in the Arizona League. He served 2017 as assistant coach at AA Tennessee. In 2010, Medina watched over Cubs prospect Matt Szczur at short-season Boise, telling MiLB.com he saw Szczur was a raw talent. "He covered a lot of ground in the outfield, had great bat speed, good eye-hand coordination and would lay off tough pitches," Medina told MiLB.com of Szczur. "He's fast too, a right-handed hitter who can get out of the box quickly and make good time to first base."